Here’s an interesting piece of history. Almost nobody knows that there was another broadcast network in the US other than the CBS, NBC, ABC, and more recently FOX (which launched in the last 80’s). DuMont was gone by 1956. It was the original home to The Honeymooners. It’s a slightly strange but fascinating time in history. Back in those days TV networks were pretty innovative as most had ties to the technology side of the business. DuMont was owned by DuMont Laboratories, a TV manufacturer. 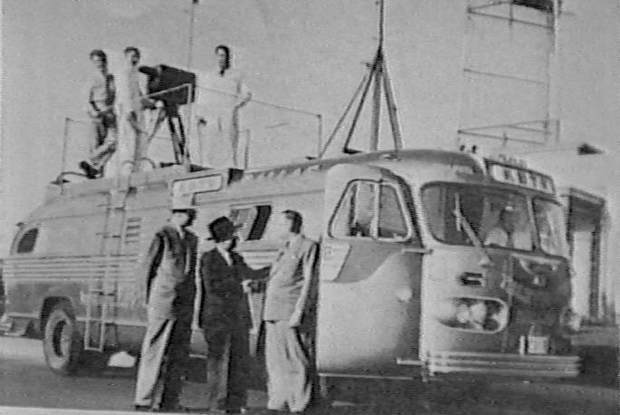 Among the things they experimented with was mobile TV production, the precursor to the modern day news van. The DuMont Telecruiser still exists. It’s in private hands and is being restored. It’s pretty impressive to see what they were able to do back then with limited technology. This particular one was apparently in use until the 70’s (post DuMont years) when it was retired.